Let us create your next sailing vacation! Galicia is a sailing paradise with so much to be explored. The Rias Baixas to the south and the Rias Altas to the north, not forgetting the wild Costa da Morte! Let us create your next sailing vacation! Galicia is a sailing paradise with so much to be explored. The Rias Baixas to the south and the Rias Altas to the north, not forgetting the wild Costa da Morte ! Stop in small nautical ports in the bays of Vigo, Pontedra, Arousa, etc... Enjoy the food and wines of the area or just sit on a sandy beach and enjoy the sun during the summer months. You could even trace the maritime route of Saint James in the Arousa bay and end with a walking portion up to Santiago. We would be glad to create any type of tailor-made sailing/walking trip for you in Galicia. A must see in Galicia according to the guardian travel in the UK which the best beach in the world "Rodas Beach" which is on the Cies Islands Atlantic Park. Our base is in the Rías Baixas, although we can depart from any place you may choose. The Maritime Route to Santiago de Compostela: It is a route already know in ancient times and one of the most traditional pilgrimage routes to Santiago. 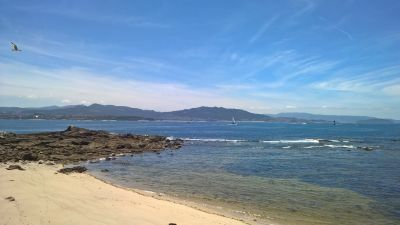 From Corunna or Finisterre (Cape of the End of the World) to the inner side of the estuary of Arousa following the route the relics of Apostle St. James undertook. It can be combined with a stretch on foot up to Santiago´s cathedral in order to experience the real feelings of medieval pilgrims. If the route is completed, a certificate that qualifies the pilgrims, the so-called Compostela, can be obtained. Route through the Atlantic Islands Natural Park: This route sails along this wonderful natural park, which includes Cíes Islands and Ons and Sálvora islands. Great scenery, with very interesting flora and fauna and with unforgettable beaches and other natural spots. Cetaceans and see birds can be watched resting in the solitary beaches and unforgettable spots. Route through the Galician estuaries: Geologic phenomena and maritime ecosystems of great importance and relevance within the Spanish coastline. Perfect spaces for leisure sailing filled with traditional fishing villages and immense sand areas guarded by woods. Throughout the year you will be able to enjoy wonderful climatic conditions for sailing, fishing and other water sports. Food, cultural heritage, ethnography are some of the arguments this area has to offer. Route along the Costa da Morte: from the North of the Atlantic coast to Finisterre, a vision of the coast from the sea that you will never forget. It is the most mysterious sailing area in Europe. History and legend go hand in hand in an authentic and unforgettable experience. Other routes: Galician North estuaries (Rías Altas) (still much to be discovered). Galician coast on the Bay of Biscay. Portuguese North coast down to the city of Porto. Madeira, the Canary Islands, Azores or any other place you might like. We organize a route especially tailored to suit your most personal needs. Let us know your preferences and if any of the routes above would interest you. We can also create a customized trip for your group departure.